Whether you're shooting waterfowl or simply near water, you need steel shot to avoid lead contamination. 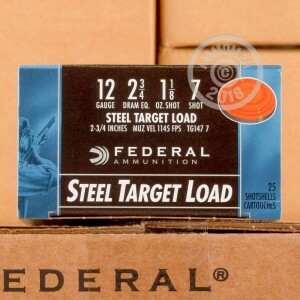 These 12 gauge Federal Top Gun loads are ideal for this purpose and fire a 1-1/8 ounce payload of #7 steel shot that will work great on birds and targets alike. 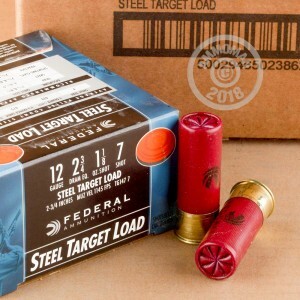 This shotshell ammunition is manufactured in Anoka, Minnesota and uses the popular 2-3/4" shell length. 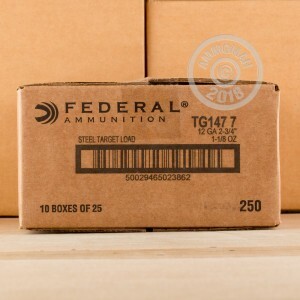 This 250 shell case (10 boxes of 25) is great for extended shooting sessions or a great time with friends or family. Make a good deal even better with AmmoMan.com's free shipping promotion, which applies to all orders over $99!